Aa great way to show customers that yhou care about their vehicle. Protects vehicle while servicd and eliminates the need for costly cleanup. 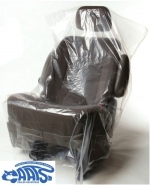 Premium Seat Cover is .7mil thickness on rolls of 250 only.